Amino Fuel is a highly concentrated source of Amino Acids Providing Nitric Oxide (NO3) to enhance endurance. Proteins are the building blocks of life and these proteins are made up of amino acids. The muscle protein is constantly being broken down by the body in order to meet the demands of strenuous exercise, stress and infection. This process is known as catabolism. When the body is in a prolonged state of catabolism it can lead to cellular malnutrition, impaired gut function and digestion, poor uptake of vitamins, amino acid deficits, impaired protein production and muscle wastage. Using Amino Fuel ensures your horse is receiving a variety of amino acids in their, which helps reduce the effects of catabolism within the muscle cells. 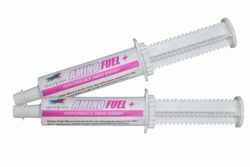 Amino Fuel is an effective way to ensure the demands for amino acids are being met, while also providing energy.